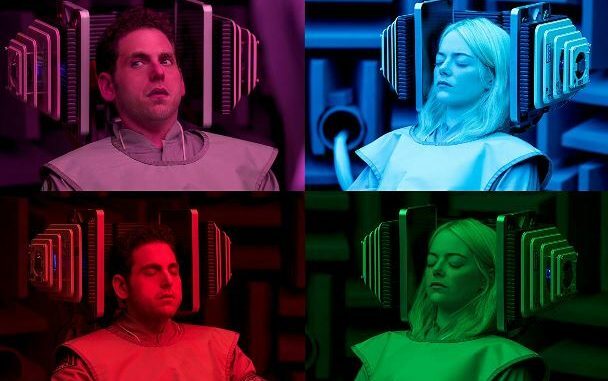 When first watching Maniac, a limited series on Netflix, it appears to come from a dream someone had that combined the worlds of Blade Runner, Back to the Future Part II, and the thought process of post-Twin Peaks David Lynch. The style of the series reflects multiple decades from the 1980s life of the New York City middle class with capitalistic dreams galore, to the idealistic nature of the 1950s. In the first episode, the most prominent character is Owen. Owen is a man dealing with typical life complications from troubles with his job to acceptance by his wealthier family. But he also faces the issues of someone on his own in many ways, his grasp on reality and what struggles remain in dealing with his mental illness which is most likely schizophrenia. Owen is often flat in his emotion in dialogue with others throughout his time on screen, but it is what he declares or states that makes the audience feel for him and root for him to be respected finally by those around him. The most important setting is the building owned by a pharmaceutical Biotech company, Neberdine. A beautiful shot introduces what would be a typical high-rise building in a city with bland tan stucco surrounding thick glass windows, but along the side are vertical panes in variety of colors resembling the stripes from the famous Polaroid camera of the same design. The show presents the simplicity of design and color that was in the ’80s but it does it alongside a difficult subject-matter of mental illness, social stigma in that illness, and what happiness can be found in our own realities. The characters being solely in the middle of most frames gives us a deeper connection to the moment while remaining a comfortable distance as observers of this world. The world presented to us is strange and sometimes difficult to grasp when multiple genres seem to come into play, but since it draws you in so quickly you can easily forget to care about your initial confusion.